Award-winning author and illustrator of The Dot, Ish, and The Dreamer, will read aloud his fabulous new children’s book and share wisdom. "This is Going to be an Incredible Day"
1. What information surprised you, was a good reminder, or strengthened your understanding of the word challenge? 2. What is important for families, caregivers, and everyone to know and understand? 3. How might we share what is most important in a way that everyone understands why it is important, and will be inspired to do it? What can we all do to help make words and word play part of everyday life for all children. 4. What might you do in your personal, professional, and civic roles to promote and support everyone talking to babies and children– in families and in communities? Welcome to The Multi-Community Read of Thirty Million Words. Count on 14 weeks of excitement and inspiration, from January 25th to May 3rd, with two weeks for each chapter–one week for reading and one week for focus on action. Join in anytime! Thirty Million Words is our catalyst and our connector. It will serve to shine light on the challenges our children face when they haven’t heard enough words, and lift us toward all families, caregivers, and community members knowing that just as we nourish children’s bodies with food to grow, it is essential we nourish our children’s minds with words. Our shared reading of the book also begins our collective action. Everyone plays a crucial role in the Talk It UP! Word Movement which will propel us from understanding to creative action! The Multi-Community Read of the book Thirty Million Words will serve as a national community-literacy pilot to be shared by Children’s Reading Connection once it is fully developed. Let us know if your community is interested! *Book Discussion Groups begin the week of Feb. 12 with Chapters 1 & 2. No pre sign-up needed. Please let us know if you would like to start a discussion group. 1. What information surprised you, reminded you, or strengthened your understanding? 2. What is important for families, caregivers, and everyone, to know and understand? 3. How might we share what is most important so everyone understands why it is important, will be inspired to do it, and will have the skills? What can we all do to help make words and play with words part of everyday habits and everyday life for all children? 4. What might you do in your personal, professional, and civic roles to promote and support everyone talking to all babies– in families and in communities? • Pass it along to someone to read–especially to an expectant family! • Like us and Follow us on Facebook. • Share ideas you have and initiatives you are undertaking to promote and support more everyday talking to babies and children. • Find book discussion groups to join on Facebook, or let us know what you need to start your own. • Watch for a mid-read event and a culminating event in May! Why is "Thirty Million Words" important for communities to read together? We know that talking to babies and children is essential for brain development, and that the quantity and quality of words children hear are critically important factors in developing babies’ brains and their well-being. Yet already by the age of three there is an astounding difference of 32 million words in the number of words some children have heard. And children hearing fewer words are often hearing more negative words, which can create a “belief gap" in self-esteem that can impact children’s learning and sense of self for life. Words count, and we need to nourish all babies and children with lots of them! New understanding and inspiration from the book read will result in creative and collective action for increasing quality and quantity of words spoken to children- in families, in organizations, and in our community. Our ultimate goal is to together create a new social norm- that all families will know and be inspired to nourish all babies and children with an abundance of loving and wonderful words everyday, everywhere, starting at birth and even before! Interested individuals and organizations are welcome to be involved. Interested organizations are invited to read TMW together with any number of their staff, volunteers, and/or board members. Organizations are invited to look for new ways to encourage and support families and those caring for children, to increase the quantity and quality of words spoken with children within their organizations, and throughout the community. There will be book discussion groups for individuals to join, and books will be available at public libraries and community locations. If you have any questions, or would like additional information, please email us, or call 607.227.3360. 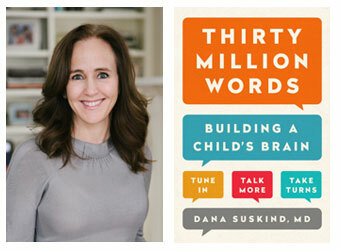 Learn more about author Dr. Dana Suskind, the activist for baby talk, in this NPR article. The Multi-Community Read of TMW is national pilot model initiative being created in partnership with Children’s Reading Connection. Once developed fully it will be shared with communities across the country. Funding for The TMW Read has come from outside of Tompkins County, from an anonymous donor dedicated to the CRC vision of all children having what they need to love and learn to read. Special thanks to community organizations, libraries, schools, colleges, and businesses who are joining in, and who and are committed to helping create a Word Movement!